I've experimented with something I call "Patterns". A pattern is an intelligent structure that can be created by analyzing a figure. For example "matrix leftArm is attached to leftArmBone". "curve1 is deformed by point1.Pos, point2.Pos, point3.Pos"
"there is a rope connection between point4, point5 and point6"
"point1, point2, point3, point4 is connected to a rigid"
The good thing with patterns is that they can be changed. For example, I want to make a leg a little longer. 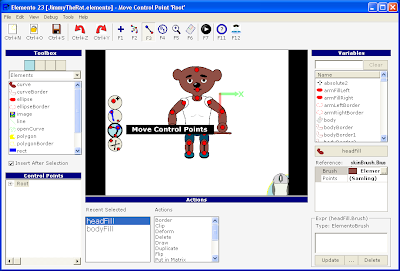 In the bone tool, when you use the "move point" action, Stickman recognize all patterns connected to that control point. Elemento updates the patterns while the user drags the control point.